Servant of Shishigou Kairi as part of the Red Faction in the Turifas Holy Grail War of Fate/Apocrypha. 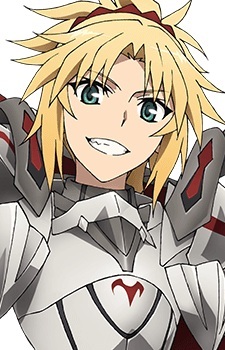 Saber's identity is Mordred, the "son" of King Arthur, but she is actually female despite being raised as the secret male heir to the throne. She was told to hide her status and obey the king. She was conceived between Arturia and her sister, Morgan le Fay, through unorthodox circumstances. Arturia, normally female, was a pseudo-male at the time due to Merlin's magecraft, so Morgan enchanted her with a spell to extract sperm from her. Morgan developed it within her own ovary, and made the child into a homunculus clone of Arturia. Due to her status as a homunculus, she was given a much faster growth period than a regular human being, and her life span was far shorter. In the Fate/stay night anime, Mordred did appear in one of Saber's flashbacks.